I really do not remember this place, only that the name of the venue sounds familiar. We were there in 1978, and my booking calendar confirms that we only played one night. That was a lot of work, especially considering what it took to set up the equipment for the Beatles Tribute. Picture this. Since we didn’t have roadies, we had to move all of our amplifiers and sound equipment from our trailer onto the stage, set it all up and do a sound check. While the equipment went up, Jon and Carl would be hanging the two projection screens on each side of the stage for the films and slides we had from the Beatles archives. It makes me tired just thinking about it! 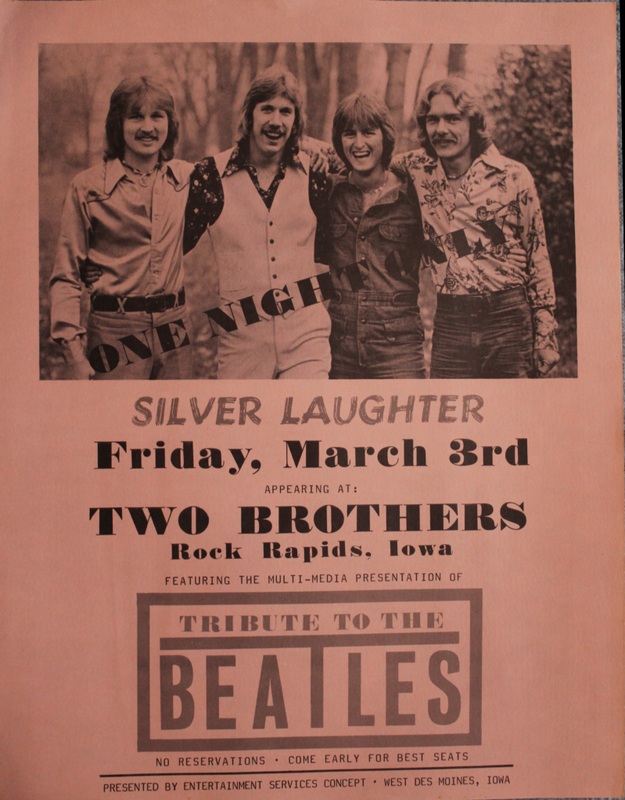 Most nights we played three or four 45 minutes sets with the Beatles Tribute as our last set… I think! I may have to check with Jon on that one. Remember, it was over 35 years ago! We started playing Two Brothers Club while Steve, Denny and Mark were still in the band. We lived in a trailer next to the club, remember? Mostly one week (6 night) gigs. Occasionally a two week gig. As you know, there were a lot of funky accommodations in those days! How about the time they locked us in at that place in Canada… Lethbridge, I think it was. The poster and my calendar for 1978 confirm that this was a one night job, for some reason.